Alexander ‘Iceman’ Heinrickson was born a prince. The spare heir to a European principality whose future was set in stone. Until circumstances forced him to abandon his wealthy lifestyle and royal heritage. He chose to become a soldier. After years of seeing needless combat, he works construction in New York city. And craves a normal life. Going back home is not an option for him. But neither is leaving a brave damsel in danger. Sasha Ray is an aspiring teacher and a soft touch waitress. Her life is normal. Boring even. She also has a massive crush on the newest Tall, Blond, and Handsome who frequents the New York deli where she works. What she doesn’t know about the stranger called Iceman might get her killed. Or worse. For one, he turns out to be a lethally capable soldier. For another, he is the secret Prince of Stellangård, who is not used to the word no. So, when Alexander sweeps her off on a private jet to his castle nestled in the Swiss Alps for her own protection, she has no choice but to go with him. Falling for a tortured hero like Prince Alexander might be the biggest mistake of her life. But Sasha knows some mistakes are worth risking your heart for. With an unknown enemy closing in, Sasha and Alexander need to decide if happily ever after is just a fairy tale. Or can a Prince and a commoner find true love in the middle of danger? Meet the Royals of Stellangård - Alexander, Helena, and Michael - burdened by their heritage, freed by love, in three standalone novels of romantic suspense and action. The Soldier Prince is an interesting Romantic story between a waitress and a prince. Sasha is an ambitious individual who wants to become a writer and works as a waitress in a restaurant to meet her expenses. Alexander is the member of the Royal family of Stellangard who is in disguise for personal reasons working in a construction company. It is a love at first sight for Sasha watching Alexander daily as a generous customer who donates food to the poor. Accidentally, Sasha finds out about the murder attempt on Alexander and saves him. The love story starts from there. Romance, relationships, complications with Royal life, protocols, responsibilities, national politics, political strategies etc., fill up the remaining story. I liked the romance, the family politics and the details about the royal family. This reminded me of Mills and Boons novels where the Prince charming is the handsome hero and the heroine is an attractive and intelligent middle-class damsel. Since this is the first part of the series, we can expect another great story about Lena, Alexander's sister in the next part. Stellangard being a not so popular place, made the background of the story look fresh and interesting. The narration is casual and the flow of events is good. Since this is the first part of the series, I felt the story is incomplete, which is natural. But, I would have enjoyed reading more about Lena and Alexander's parents. I felt the story is stretching a bit unnecessarily at some point. I would recommend this to the readers who love action-packed romance. I rate books by the 5-star rating system. 2/5: Below average, I don't like it. 3/5: It is ok with some faults. 4/5: I liked it and I recommend it to others though it has slight imperfections. 5/5: It is awesome and I will definitely recommend it to others. ps: I have received the ARC from the author for review and this is my honest opinion on the book. Aarti is an incurable romantic who has taken up the task of bringing Happily Ever After to life for the characters in her head. She currently writes steamy contemporary romance for urban millennials with a global twist such as With You I Dance and the Geeks of Caltech series. She also writes romantic thrillers such as White Knight, Kingdom Come, Royals of Stellangard trilogy and more. Sometimes there are guns and car chases too. Aarti has appeared as a panelist and speaker at several lit fests in India. While pursuing her dream job, Aarti has taken a detour into business journalism, copy editing and corporate communications. She’s a graduate of Mumbai University with a Bachelor’s in Mass Media and Journalism. She conducts creative writing workshops and dabbles in poetry too. 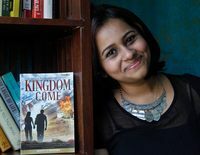 She loves to hear from her readers and friends by email at author@aartivraman.com, on Facebook as Aarti V Raman-Author, Twitter @RT_writes, Instagram, and Goodreads. You can also join Aarti’s monthly newsletter and stay updated on the latest from Writer Gal.